"Sampath Speaking" - the thoughts of an Insurer from Thiruvallikkeni: Zimbabwe recreate history - beats Australia... Chloe Traicos - who ??? Zimbabwe recreate history - beats Australia... Chloe Traicos - who ??? 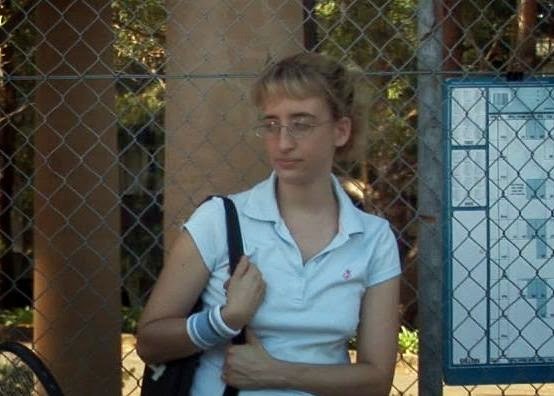 She is an actress and writer too ………..one may not instantaneously recognise her. – the connection to this post ?? – do you what Australian Press has to write about after this match ??? Trent Bridge, 1983; Newlands, 2007; Harare Sports Club, 2014 – great days for Zimbabwe, their three international victories over Australia - to dramatise it, Cricinfo stats revealed that it is 11,406 days since Zimbabwe's last and only other ODI-win came against Australia. They had beat Australia in the 1983 World Cup, at Trent Bridge, which was also Zimbabwe's first ODI. Between the two wins, Zimbabwe's win-loss record against them was 27-0. That Newlands win was in T20 WC. In the Tri Nation tournament, Zimbabwe chasing made 211 for 7 (Chigumbura 52*, Lyon 4-44) and created history beating Australia 209 for 9 (Clarke 68*) by three wickets. In what was 30th ODI meeting between these sides, Zimbabwe did what they had not for 31 years - beat Australia. The captain Elton Chigumbura engineered the chase that changed 11,406 days of history, after his spinners had applied a stranglehold that kept Australia to their lowest total against Zimbabwe, and achieved only their second win against these opponents. In the early hours of a Tuesday morning in 1983, Australia's prime minister Bob Hawke famously told the country that "any boss who sacks anyone for not turning up today is a bum". Australia II had just won the America's Cup. It was one of the nation's most defining moments of the 1980s, the end of New York Yacht Club's 132-year hold on the trophy ~ and then the mighty Australians lost to minnows in 1983 World Cup. Michael Clarke and his men courted trouble underestimating the opponents and paid heavy price; now Aussies theoretically have the chance of not reaching the tri-Nation finals, should they lose badly to South Africa and if Zimbabwe can win against SA too. A 55-run stand between Chigumbura and Prosper Utseya for the eighth wicket ensured Zimbabwe did not fold and sent Harare Sports Club into frenzied celebration. The dancing in the stands had begun in the morning when Zimbabwe reduced Australia to 39 for 3. In the last 10, they needed 44 - Chigumbura and Utseya hunted them down in calculated fashion. Way back in 1983, Zimbabwe batted first and slipped to 94 for 5 at lunch before Duncan Fletcher, their captain, led an afternoon recovery that guided them to 239 for 6. Australia were ambling along at 114 for 2 - they finished 13 runs short. Some said, the upset went unnoticed as it was the general election which took all the attention – reelection of Margaret Thatcher and the match was not covered due to BBC technicians on strike. In that ODI debuted alongside 10 others was the Off spinner - John Traicos – he was 37 then and had made his Test debut - for South Africa - in 1969-70 in their final series before they were cast into sporting isolation. When he played his final match in India in March 1993, he was 45. Egyptian born, he grew up in South Africa, touring England in 1967 with the South African Universities, and thereafter played for Rhodesia/Zimbabwe. When Zimbabwe were finally admitted to the fold in 1992, Traicos, despite his age, was still far and away the best offspinner in the country – played – took 5 for 86 including Sachin Tendulkar out for a duck. His international career ended when business commitments meant he was not available to tour Pakistan in 1993-94. Traicos fled Zimbabwe with his family in 1997 for political reasons and is now a company secretary in Australia. His daughter, Chloe Traicos is an actress and writer, known for Next Door to the Velinsky's (2011). As a kid growing up in Harare she was part of a drama group for teenagers at the Reps Theatre. She moved with her family to Australia during her teens, where she continued her pursuit of an acting career by performing in plays, eventually scoring her first film role in Garage Days in 2002. She is now based in LA, both acting in and producing feature films. Here is what Couriermail.com.au wrote after the loss : some of Zimbabwe’s cricketing paupers can barely put food on the table for their families but they have made Australia’s millionaire men the laughing stock of world cricket. Test captain Brendan Taylor is the highest paid player in the history of Zimbabwe cricket, recently earning a contract upgrade to US$120,000. That is big bickies compared to some of Zimbabwe’s lowest paid cricketers who earn as little as US$800 a month and struggle to support their families. And that is if they actually get paid by their cricket board. Players recently felt great progress has been made when they got paid for the third month in a row. Some Zimbabwean players have even taken sandwich makers on tour so they can save on food costs. By contrast, Australian skipper Michael Clarke scoops $2 million a year from Cricket Australia and you can more than double that when you include his sponsorships and personal endorsements. But that all meant nothing when Australia slumped to one of its most embarrassing cricket losses and Clarke trudged home from Harare with the latest injury to his failing hamstring. 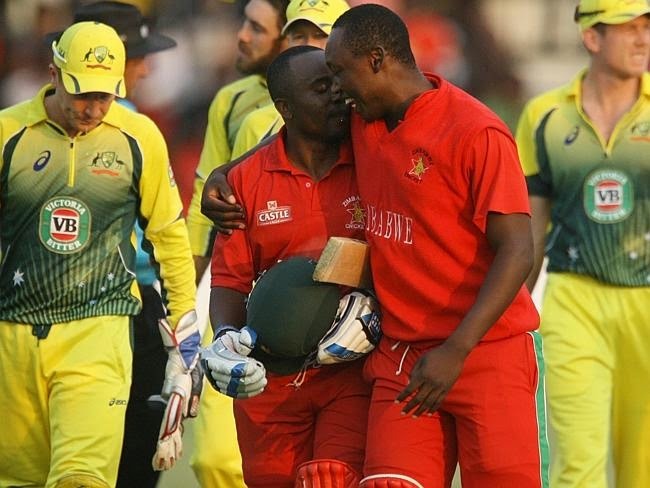 Zimbabwe players danced arm in arm as they celebrated their first win over Australia since 1983, the same year Bob Hawke became Prime Minister and Australia II won the America’s Cup. Australia’s woeful loss in Harare has also opened cracks in the ranks with skipper and former selector Michael Clarke unhappy with the side he was given by selectors. Dhoni's first ball duck ... CSK posts 242..